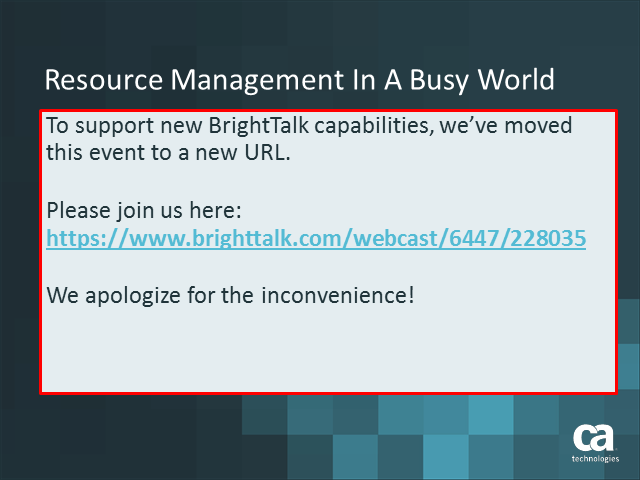 To support new BrightTalk capabilities, we’ve moved this event to a new URL. Resource Management is a relatively straight forward concept with significant benefits. However, some organizations choose to postpone those benefits and focus on other aspects of PPM. How can we extend organizational maturity for PPM with high value outcomes from Resource Management? Please join Erich Kissel, CA Services Architect for PPM, and Lars Matzerath, Head of Sales from itdesign GmbH for an insightful discussion on Resource Management on Friday, Oct.7th. for CA PPM: itd Assignment Editor and itd Allocation Editor which enhance project and resource managers’ visibility and editing options of resources. From assigning and aligning resources to projects, evaluating and normalizing demand, to gaining a better understanding of available skills, it’s time to fulfill your resource management aspirations!